20th century not warmest, researchers find at the University of Delaware. April 15, 2003 - A review of more than 200 climate studies led by researchers at the Harvard-Smithsonian Center for Astrophysics has determined that the 20th century was neither the warmest century nor the century with the most extreme weather of the past 1,000 years. 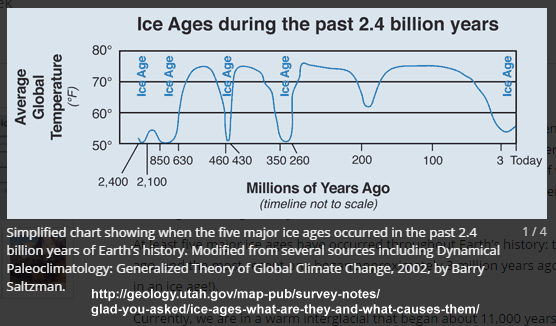 The review' which included work by David R. Legates, director of the University of Delaware's Center for Climatic Research, also confirmed that the Medieval Warm Period of 800 to 1300 A.D. and the Little Ice Age of 1300 to 1900 A.D. were worldwide phenomena not limited to the European and North American continents. Legates said the paper argues against a recently espoused view formulated by Michael Mann of the University of Virginia and his colleagues that global air temperatures remained fairly constant from 1000-1900 A.D., then increased dramatically in the 20th century. "Although [Mann's work] is now widely used as proof of anthropogenic global warming, we've become concerned that such an analysis is in direct contradiction to most of the research and written histories available," Legates said. "Our paper shows this contradiction and argues that the results of Mann...are out of step with the preponderance of the evidence." According to the paper, while 20th-century temperatures are much higher than in the Little Ice Age period, many parts of the world show the medieval warmth to be greater than that of the 20th century. Smithsonian astronomers...compiled and examined results from more than 240 research papers published by thousands of researchers over the past four decades. Their report, covering a multitude of geophysical and biological climate indicators, provides a detailed look at climate changes that occurred in different regions around the world over the last 1,000 years. ...In fact, clear patterns did emerge showing that regions worldwide experienced the highs of the Medieval Warm Period and lows of the Little Ice Age, and that 20th-century temperatures are generally cooler than during the medieval warmth...The study-funded by NASA, the Air Force Office of Scientific Research, the National Oceanic and Atmospheric Administration, and the American Petroleum Institute-will be published in the Energy and Environment journal. A shorter paper by Soon and Baliunas appeared in the Jan. 31 issue of the Climate Research journal. The worldwide range of climate records confirmed two significant climate periods in the last thousand years, the Little Ice Age and the Medieval Warm Period. The climatic notion of a Little Ice Age interval from 1300 to1900 A.D. and a Medieval Warm Period from 800 to 1300 A.D. appears to be rather well-confirmed and wide-spread, despite some differences from one region to another as measured by other climatic variables like precipitation, drought cycles, or glacier advances and retreats. "For a long time, researchers have possessed anecdotal evidence supporting the existence of these climate extremes," Baliunas said. "For example, the Vikings established colonies in Greenland at the beginning of the second millennium that died out several hundred years later when the climate turned colder. And in England, vineyards had flourished during the medieval warmth. Now, we have an accumulation of objective data to back up these cultural indicators." Ref. University of Delaware.